Synopsis: Lorna Webster (Nancy Kelly) is returning to her New England hometown of Eben Rock, Massachusetts after spending several years away. The bus she is riding on stops along the road to pick up an elderly woman (Elspeth Dudgeon) who has flagged the driver down. It is late at night and the driver is reluctant to take the woman on, and refuses outright to take the woman's dog. The old woman agrees to leave the dog on the side of the road and boards the bus. The woman sits by Lorna, and seems to know her by name. She says that Lorna is the descendent of Elijah Webster, a judge who 300 years ago sentenced a number of witches in the town to be burned at the stake. 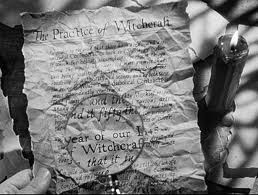 She tells Lorna that she herself is Jezebel Trister, a 300 year old witch who had been condemned by Judge Webster, which greatly startles and alarms Lorna. Almost immediately, the bus plunges off a steep embankment into a lake. In the town, Lorna stumbles into the local tavern, and it's clear that no one in the place had expected her to arrive, including her ex-fiancee, local doctor Matt Adams (John Loder). When Lorna tells of the bus accident, the authorities go out to the lake. They pull a number of bodies from the water; but Lorna is the only survivor. Moreover, none of the bodies matches the description of the old woman Lorna describes. As the local physician, Matt nurses Lorna back to health. He is pleased to see her, even though she had stood him up at the altar years before. The other townspeople are not so forgiving, particularly Ruth Gibson (Ruth Ford). Ruth resents what she had done to Matt, and remembers that bad luck always seemed to follow Lorna, that everything she touched seemed cursed. The bus accident is only the latest proof of this: how is it possible that she walked away without a scratch, when everyone else was killed? Matt gives Lorna a black shawl that she'd had with her after the accident. Lorna is alarmed -- she knows it isn't hers, but Jezebel Trister's. Matt says that can't be possible. Lorna, he says, must have imagined meeting Jezebel Trister, since no old woman was found among the bus accident casualties. 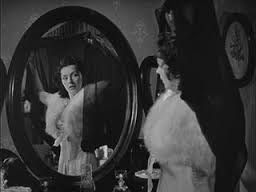 Uncertain, Lorna tries on the shawl after Matt leaves, but when she looks in the mirror, she sees the face of Jezebel Trister appear over her own. Comments: Tonight we have the second broadcast of The Woman Who Came Back, a Republic feature with an interesting cast and a spooky atmosphere that's marred somewhat by a clunky, explained-away ending. 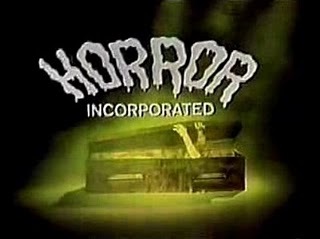 This modest programmer seems to have come and gone pretty quickly from theaters on its initial release in December of 1945, but it turned up regularly on TV schedules through the 1960s and there's little question that viewers of Horror Incorporated would have been familiar with it. 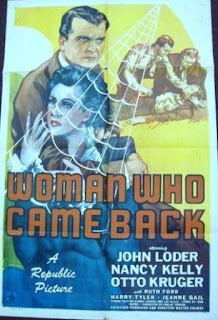 The Woman Who Came Back was made at a time when explained-away endings were enjoying something of a renaissance in horror films, maybe because Val Lewton was dominating the genre at the time. Lewton made atmospheric horror fare with a strong psychological undercurrent; Cat People, his best-known film, pitted ancient tribal fears against the modern science of psychiatry in order to make us question just what we believe, and in fact the question of whether the Cat People's curse itself is real or just a sexually repressed woman's delusion isn't revealed until the final minutes. While Lewton wouldn't have gone for something as crass as an explained-away ending, his imitators often did, and films like this one, The Beast With 5 Fingers, The Soul of a Monster and She-Wolf of London all went the same route. This was an especially tempting cheat for filmmakers who were uncomfortable making genre movies; they could reassure themselves -- and the audience -- that their film was grounded in safe, respectable reality. 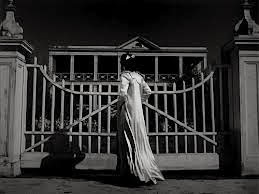 A number of scenes strive for a spooky Lewtonesque vibe, as when Ruth (Ruth Ford) walks from the church, along the streets of Eben Rock at night, slowly realizing that the mysterious dog is following her. Such attempts always lack Lewton's indefinable spark, but they do indicate the filmmakers were paying attention. The Woman Who Came Back has a strong and eerie opening sequence which ends with Lorna being the sole survivor of a bus crash. And the movie has an ominous atmosphere that's aided by some decent day-for-night shooting. But the film is rather talky and drags in places where it should be building suspense. And the explained-away ending leaves some gaping plot holes behind it; if Lorna isn't cursed, how did the fresh flowers Matt brought wither and die by the time he gave them to her? How did the woman on the bus (whom we learn wasn't Jezebel Trister) find Lorna, and how did she know her name? Director Walter Colmes only directed a handful of films, and this was probably the best-known of them. His work is straightforward and unimaginative. 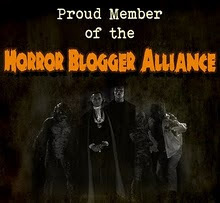 But he has at his disposal some very good actors: John Loder, whom we just saw last week in The Brighton Strangler, Otto Kruger from Dracula' s Daughter and Ruth Ford, who lost her marbles in The Man Who Returned To Life. This is the only film I've seen Nancy Kelly in, but does quite well as the tormented Lorna. Nancy Kelly's earliest roles were in John Ford's SUBMARINE PATROL, Henry King's JESSE JAMES, and Allan Dwan's FRONTIER MARSHAL, all with John Carradine and Lon Chaney. By 1940 she did Abbott and Costello's feature debut ONE NIGHT IN THE TROPICS, but remains best remembered as the distressed mother of Patty McCormack's 8 year old psychotic in THE BAD SEED.